Celebrating the 50th anniversary of Doctor Who, this Source book explores the Fourth Doctor's adventures on Earth and beyond. 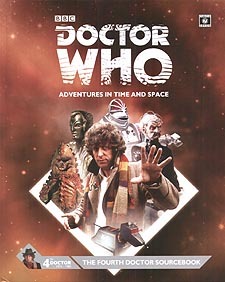 With detailed information on all the allies, enemies, aliens and gadgets that he encounters, as well as examining each of his adventures, the book contains a wealth of material for the Doctor Who: Adventures in Time and Space RPG, and is also a fact-packed resource for fans of the show. Freed from his exile on Earth, the doctor returned to his wandering ways, drawn to some of the great battle of the cosmos. Team up with a fellow Time Lord and a robot dog, explore E-Space, search for <>The Key to Time and return to Gallifrey as its saviour. Uncover the secrets of the Pyramids of Mars, change the Destiny of the Daleks and thwart the machinations of the Master's final incarnation.